Orphan Jack Templar has no memory of his parents and only the smallest details from his Aunt Sophie about how they died. The day before Jack’s fourteenth birthday, things start to change for him. At first, it’s great: A sudden new strength helps him defend his nose-picking friend “T-Rex” from the school bully, and even his crush, Cindy Adams, takes notice. But then a mysterious girl named Eva arrives and tells him two facts that will change his life forever. First, that he’s the descendent of a long line of monster hunters and he’s destined to be in the family business. Second, that there’s a truce between man and monster that children are off-limits…until their fourteenth birthday! 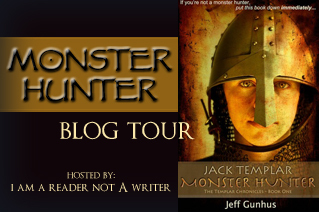 Jack has only one day before hundreds of monsters will descend on his little town of Sunnyvale and try to kill him. I chased after Eva, second-guessing my decision that the whole day was a dream. I had almost caught up to her when a massive beast erupted from the ground in an explosion of dirt and leaves. The creature towered over Eva, nearly seven feet tall even with its feet still in the ground. It was naked except for a loincloth wrapped around its waist. The rest of the hairless body bulged with muscles. The creature’s hands were webbed with thick, yellowed nails sharpened to points. The face was a cross between a man’s and a mole’s. Tiny black eyes, no more than pinpricks, were positioned above a flat pink nose with fleshy feelers sticking out. The creature roared at Eva, showing a mouth full of jagged teeth. It swung a clawed hand at Eva’s head. She ducked easily, tucked her shoulders and rolled to one side. The mole-creature screamed and stepped out from the hole, moving more quickly than I would have imagined it could. It raised a massive, webbed foot over Eva, aiming for her head. Eva rolled again and the mole-creatures foot slammed into the ground. Even from where I was, I felt the earth move. Eva was up and running. The mole-creature rampaged through the forest after her, smashing whole trees in his way, ripping down branches. But Eva was quick on her feet, running just ahead of him, ducking the debris that he threw at her. I ran after them. I didn’t have a clue what I would do if I caught up to them, but I knew I couldn’t just let her face that thing on her own. I reached a clearing. I saw that Eva had her sword drawn now and was still running hard. The mole-creature grabbed a rock the size of a bowling ball and threw it. “Eva!” I yelled. But it was too late. The rock hit her in the shoulder so she was thrown off balance; she stumbled and went to the ground. I saw her sword fly through the air and stick into the ground, tip first. The mole-creature closed in, screaming at its prey. It swung a massive arm at Eva. She blocked the blow but still went flying in the air from the force of it. Without thinking, I ran toward the creature, yelling as loudly as I could. I waved my arms. Anything to distract it. The mole-creature turned toward me, its pink, fleshy nose quivering. It lowered itself onto all fours and stampeded in my direction. I felt all the blood rush out of my legs. I couldn’t move. I just stood there, frozen, as that wall of muscles ran toward me. I braced for impact. But about ten feet from me, the mole-creature was yanked backward as if it had reached the end of some invisible collar around its neck. It fell to the ground, wailing in pain. I just stood there, dumbfounded. Slowly, the creature climbed back to its feet and shook its head. It spotted me again, stood up tall, pawed the air like a grizzly bear, and roared at me. That’s when I remembered. I wasn’t fourteen yet. I was off limits. I took a careful step toward the mole, sizing up whether I was really safe or not. Satisfied that he wasn’t going anywhere, I started getting a little cocky. “You can’t touch me, can you?” The mole screamed at me. “Yeah, go ahead and roar you ugly pug!” I yelled back. The mole-creature spun around, lowered back to all fours, and ran straight toward Eva. Eva was on her feet but I could tell that she was a little unsteady from her fall. She was slow to react and the mole-creature smashed into her and sent her flying into the long grass.